Those who know me, know I love The Walking Dead. I love that it is filmed in my beloved Atlanta. I love the suspense and the survival and, yes, the insanely outrageous gore. Why do I profess this love for a TV show on a PR and Social Media blog you ask? Because Grady Memorial Hospital in Atlanta was featured in last Sunday’s Walking Dead episode. And, today, they made the most amazing social media meme of all time. Ever. The November 2nd episode was a psychological thrill ride to be sure. We finally got to see what happened to Beth (Emily Kinney) after she went missing during season four. (She was being attacked by walkers when strangers pulled up in a mysterious black car, fought off the walkers, grabbed Beth and took off down the road). She wakes up in an unfamiliar place – a hospital room. She looks out the window to see the napalmed cityscape of Atlanta. The door is locked. A doctor and police officer come in and tell her she is at Grady Memorial Hospital. Things seem okay, even boring for a minute or two. But, it’s The Walking Dead, so it didn’t stay that way as they creepily tell her “they saved her life, so now she owes them.” What happens next is best left watched on your own – in the dark, clutching someone close. But, here is the cool part. 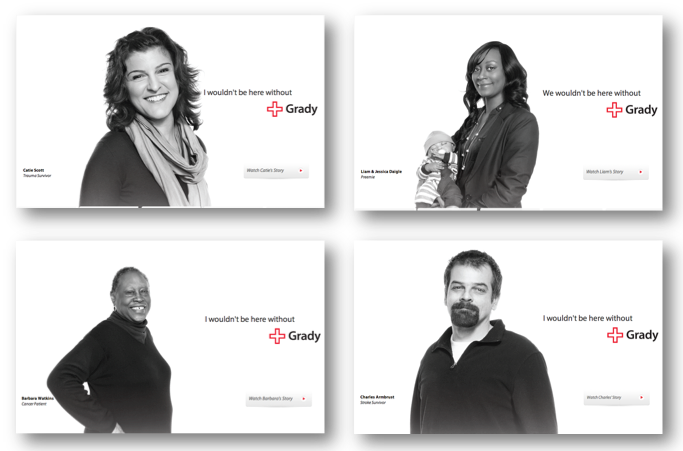 Grady Hospital has been running a campaign called “I wouldn’t be here without Grady” in which patients talk about how the hospital saved their lives. And, this week, they added one new “patient” to their campaign: Beth, describing her harrowing ordeal in the zombie apocalypse. Not surprisingly, the meme, which first appeared on the brand’s Facebook page, has been making the rounds online. We’ve seen brands jump into the moment and insert themselves into current events before; the clever Oreo blackout tweet comes to mind. Still, I love how Grady inserted the show into their existing campaign. Truly brilliant. Well done, Grady! Previous Post: Is Ello As Privacy-Focused As They Claim?